Request / Response is perhaps the simplest of all the NetMQ socket combinations. That is not to say that RequestSocket and ResponseSocket MUST always be used together, that is not true at all, there are many occasions where you may want to use a particular NetMQ socket with another NetMQ socket. It is just that there are particular socket arrangements that happen to make a great deal of sense to use together, and RequestSocket with ResponseSocket is one such pattern. The particular socket combinations that work well together are all covered in the ZeroMQ guide. Whilst it may seem a cop out to simply tell you to read more documentation somewhere else, there really is NO BETTER documentation on ZeroMQ/NetMQ than you will find in the ZeroMQ guide, as it covers well known patterns that have been proved in the field and are known to work well. Anyway we digress, this post is about Request/Response, so lets continue to look at that, shall we? Request / Response pattern is a configuration of two NetMQ sockets working harmoniously together. This combination of sockets are akin to what you might see when you make a web request. That is, you make a request and you expect a response. 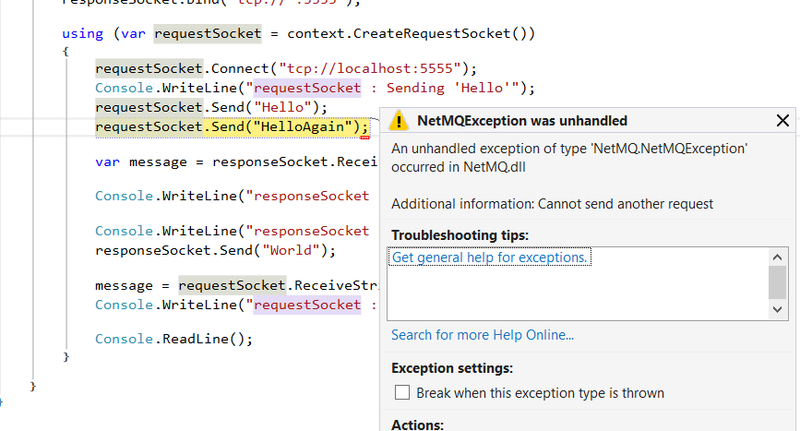 RequestSocket and ResponseSocket are synchronous, blocking, and throw exceptions if you try to read messages in the wrong order. Believe it or not you have more than likely already seen this example on numerous occasions as it is the simplest to demonstrate. Here is a small example where the RequestSocket and ResponseSockets are both in the same process, but this could be easily split between two processes. We are keeping this as simple as possible for demonstration purposes. As stated above RequestSocket and ResponseSocket are blocking, which means any unexpected send or receive calls to WILL result in exceptions. Here is an example of just such an exception. Or how about this example where we try and call RecieveString() twice, but there was only one message sent from the RequestSocket? So be careful what you do with the Request/Response pattern, the devil is in the detail.